In the last installment of the Norm Nativity, we left poor Mary Norm and Joseph Norm upon their arrival in the little town of Bethlehem. With not a room to be found in inn nor hotel, they were facing a night out sleeping rough – hardly the best conditions for giving birth to the promised one. Luckily for them, the surprisingly sharp intuition of Nancy the donkey led them all to a far warmer and cosier alternative (if a little pongy) – a stable on the outskirts of town, where soon enough Mary Norm lapsed into the inevitable agonies of labour, and gave birth to a darling little Norm baby who they called Jesus Norm, who was very soon comfortably installed on a bed of hay in a manger. The birth of Jesus Norm very soon caused waves of celestial excitement. Above the stable, a particularly bright star grew even brighter, and in the stars around it, angel Norms started gathering to celebrate the birth, flying then from place to place to spread the great news. One of the first places they visited was a nearby field, where a group of shepherds sat about having a little evening supper after a hard day looking after their not insubstantial flock. When the shepherds caught sight of a group of angels coming towards them, they almost collapsed in shock – their poor little sheep didn’t know what to do with themselves and promptly hid behind their shepherd masters. 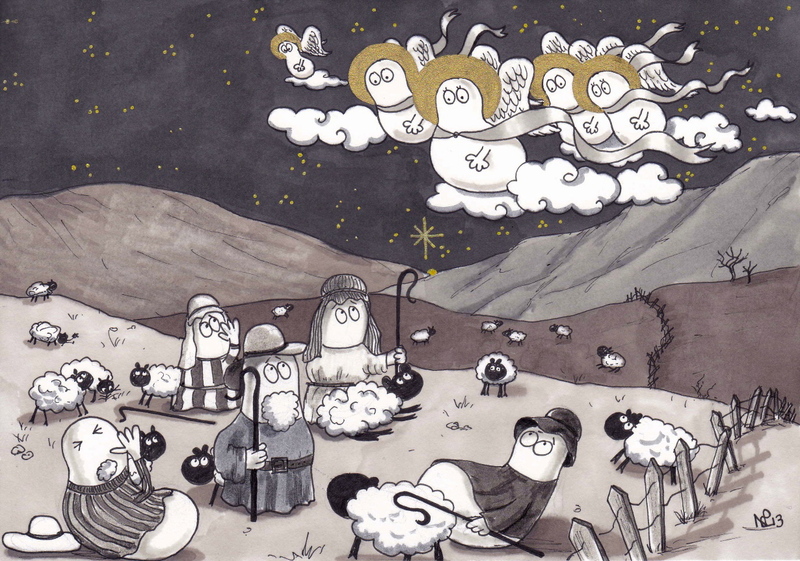 Only when the excitement of the news relayed by the angels sunk in did the shepherds (and the sheep) begin to settle, jumping up with some excitement and declaring that they must visit the baby forthwith! So unto Bethlehem the shepherds headed then, to see little baby Jesus Norm in all his glory. Join the Norm Nativity next time to see who else is making their way to celebrate the birth. And there were shepherds living out in the fields nearby, keeping watch over their flocks at night. An angel of the Lord appeared to them, and the glory of the Lord shone around them, and they were terrified. But the angel said to them, “Do not be afraid. I bring you good news of great joy that will be for all the people. Today in the town of David a Savior has been born to you; he is Christ the Lord. This will be a sign to you: You will find a baby wrapped in cloths and lying in a manger.” Suddenly a great company of the heavenly host appeared with the angel, praising God and saying, “Glory to God in the highest, and on earth peace to men on whom his favor rests.” When the angels had left them and gone into heaven, the shepherds said to one another, “Let’s go to Bethlehem and see this thing that has happened, which the Lord has told us about.” So they hurried off and found Mary and Joseph, and the baby, who was lying in the manger.